This newsletter informs stakeholders about the progress of the blue-banded bee research, which aims to implement blue-banded bees as pollinators of greenhouse tomatoes. 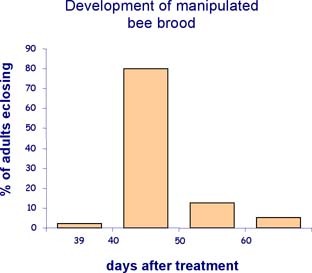 Without manipulation, 25% of blue-banded bee offspring develop into adults within 50 days, while 75% develop after a rest period. Larvae that 'rest' take 100 days or more to develop into adults. We have now worked out a treatment that causes 90% of the resting larvae to develop into adults between 40 and 55 days after treatment (Fig. 1). This allows us to wake up larvae to meet grower demands. Figure 1. After treatment, 90% of the resting larvae developed into adults in 40-55 days. Chalkbrood is a lethal disease of blue-banded bee larvae, and it is caused by a fungus. The spores of the fungus develop in the gut of the larva. Nests become contaminated when adult bees remove dead larvae with sporulating fungae from their cells. The spores can then end up in the larval food. Infestation is very contagious and if not contained, chalkbrood can have a major impact on the breeding program. We investigated how re-use of nests over several generations influences chalkbrood infestation (Fig. 2). Figure 2. The percentage of nests that contained chalkbrood was significantly higher for re-used nests than for nests that were only used for a single generation. Re-used nests contained chalkbrood ten times more often than new nests. Thus, hygienic measures such as regular removal of used nest material and supply of new nest blocks can keep chalkbrood infestation at acceptable levels. The bees performed well in the greenhouse of Biological Services. The grower, Mark Burgess did not find any difference between the rows that he had pollinated using the pollination wand, and the rows that had only bee pollination. Figure 3. After holes were found and repaired (yellow diamonds), the number of bees in the greenhouse at Biological Services, Loxton generally increased. During summer days the foil screens close to prevent the greenhouse from overheating (green diamonds). Young inexperienced bees explore their environment and fly above the screens where they die of heat and exhaustion. Thus, the regular closing of the screens during summer days makes it difficult to build up bee numbers, The closing of the screens during the night to prevent heat loss has no influence on bee numbers. Loss of bees has also occurred when sugar water ran out and after spraying. To select the most common and widespread species, Remko Leijs (SA Museum), Michael Batley (Australian Museum) and Katja have studied the taxonomy and distribution of the 36 species of blue-banded bees, using both DNA analysis of field collected bees and examination of all major museum collections. We now know that the species we currently work with is Amegilla (Zonamegilla) murrayensis. This is one of the two blue-banded bee species that is common and widespread throughout Australia, and therefore very suitable for use in greenhouses. This part of the research program is funded by a grant from the Australian Biological Resources Study.